We have the BEST independent hybrid repair in Santa Monica, bar none. Our shop foreman has been a Toyota Hybrid certified technician for 10 years, trained at the factory. Some shops claim to be “hybrid certified” and in almost all cases it's just false advertising. Why? There is no hybrid certification available right now except for the ones from the car manufacturers. Factory equipment to perform any operation the dealership can do. We can do anything faster, cheaper, and more personalized. Access to your vehicle specific maintenance/repair history. Program smartkeys (at a fraction of the cost), computers, airbags, and navigation units. Access to wholesale prices new and used factory parts, backed by our 2 year warranty. Dealerships and independents only offer an inferior 1 year warranty. 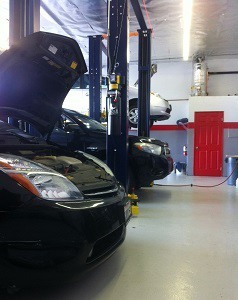 Hybrid battery service: we can rebuild, re-balance, recharge, and/or replace any hybrid battery. No upsells ever. we know what your car needs and what it doesn't, nobody here works on commission. All dealership and most independent shop personnel work on upsell systems because their salaries are 100% commission based. Come to Car Nerds today for the best Hybrid Repair in Santa Monica!